RMG Friends Ignite Durham Announce Start-Up Boot Camp! We recently hosted the DATCA awards at an RMG Fridays event. During the evening our friends from the Spark Centre announced this new initiative that is designed to encourage start-up business in Durham Region. New business boot camp has $25,000 cash for entrepreneurs in Durham Region. Ignite is presented by Spark Centre, a not-for-profit organization that offers services and support to local entrepreneurs; The Region of Durham; and VentureStart, a program that helps technology entrepreneurs in Southern Ontario. “We are on the hunt for exciting, high-potential start-ups,” said Martin Croteau, executive director of Spark Centre. “We know that Durham is full of inventors, innovators and entrepreneurs. We are going to throw the support of the entire community behind the top two companies we can find.”After a rigorous selection process involving a public Pitch Night and boardroom presentations, two “Ignite Start-ups” will be announced in early March. These two companies will then enter an intensive four-month boot camp, which includes the following: a $25,000 cash award; access to a Power Panel of high-profile entrepreneurs; and in-kind professional services from local experts in areas such as finance, marketing, and law. In addition to accelerating the success of the two chosen companies, Ignite will showcase the exceptional local resources available to all entrepreneurs in Durham. The boot camp will culminate in a public event, the Ignite Finale, on June 25, 2013 at The Regent Theatre in Oshawa. “Durham Region is proud to partner with Spark Centre to launch Ignite, the powerful next step for the Art of Transition to continue to support a strong local creative economy,” said Kerri King, Tourism Manager for Durham Region. 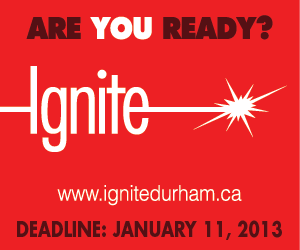 “Through Ignite, we will continue to promote Durham’s innovative culture, and create more well-paying jobs in our community.”Applications are available online and must be received by 5 p.m. on January 11, 2013. 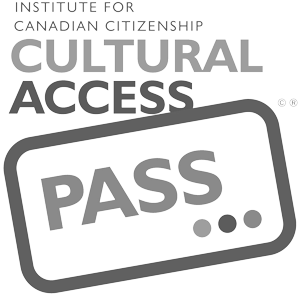 Please visit www.ignitedurham.ca for more information on the application process, eligibility criteria, and important dates. Spark Centre is a not-for-profit that helps to start and grow innovative technology-based companies in Durham Region and Northumberland County. We are one of fourteen Regional Innovation Centres (RICs) that are part of the Ontario Network of Excellence (ONE). Together we support the commercialization of ideas right across Ontario. Spark Centre’s services are provided thanks to the generous financial support of the Ontario Ministry of Economic Development and Innovation, Durham Region, the Durham Strategic Energy Alliance (DSEA) and the Northumberland Manufacturer’s Association (NMA).